tl;dr: U.S. hybrid vehicle sales were up 61% in 2012. It’s unclear why. Riddle me this: Why did U.S. hybrid sales take off last year? Prior to 2012, hybrids looked like something between a fad and a niche. Sales peaked in absolute terms way back in 2007 and hybrid market share maxed out in 2009. Despite rising gasoline prices, it seemed that Americans cared neither about getting 50 miles per gallon or the environmental benefits thereof. Hybrid sales rose 61% to 434,498 cars in 2012 – the biggest absolute increase ever and the biggest percentage gain in seven years. Hybrids accounted for 3.0% of new vehicles sold, up 42% from 2011. It wasn’t new choices. While nine new hybrid models were introduced in the States in 2012 (of a total 44 available), they accounted for only 9,708 hybrids sold (2.2%) – and the Prius took half the market like it has since 2009. It wasn’t a price drop. Prius sticker prices fell $2,500 last year (about 11%) as Toyota restocked post-Fukushima, but prices of conventional non-hybrid cars from Japan dropped too. It wasn’t an improving economy. Real GDP growth was 2.2% in 2012 and 2.8% in 2010. 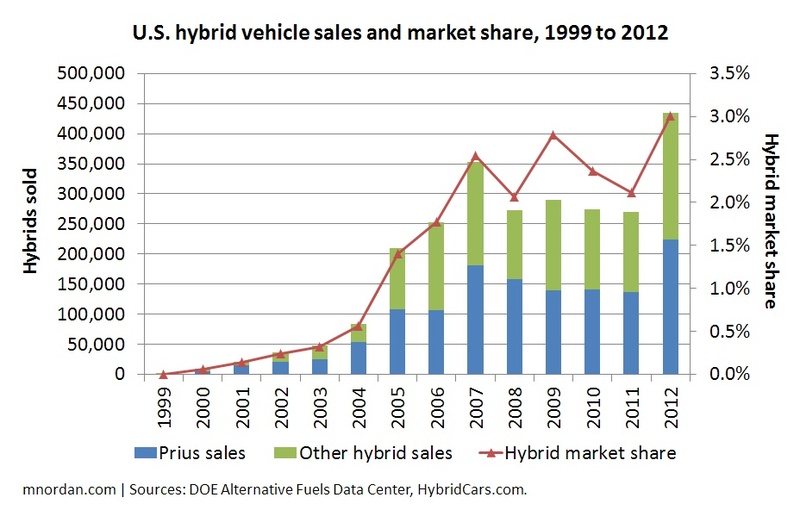 Yet hybrid market share blew up in 2012 and shrank in 2010. It wasn’t more driving. In fact, annual vehicle miles traveled per person fell slightly in 2012, extending a trend that started in 2004. “Peak car,” anyone? None of these things correlate and it makes no sense! Any ideas? This entry was posted in Consumers, Numbers, Transportation. Bookmark the permalink. Suggestion: car sales where at very low level for years as people postponed the purchase of a new car. car sales are now back up and hybrids take up their market % in slightly rising line from 2007 and 2010 (ok, this would have to mean that more hybrid buyers postponed new vehicle purchases then non hybrid buyers). Maybe societal perceptions and values are finally changing? Very interesting trend. My guess is 3-4 things drove it. While you say the range of models may not have been an influence, it may in fact have been a few models with luxury or more upmarket features that attracted a wider audience. My sense is design has improved as well, making most of the hybrids more attractive. Also, given people have cars 3-5 years on average, return buyers may have been a factor from the 2006-2008 cycle. Also, what about fleet sales? Is there a spread between standard and hybrid costs for similar/same vehicles that we can look at? I think that Raymond has a good handle on this. While your observations on economic growth cannot be dismissed, consumer confidence may be the more important factor. Consumer confidence was at a recent nadir in late 2009. This could help explain the reduced hybrid share in 2010. Add in a few consumer behavior factors (awareness threshold, consumer confidence, social reference influences) and 2012 looks like a suppressed demand response to the perceived end of the recession. There may also be some cross-sell type factors – and even cross-sell competition of sorts. Studies of the Residential PV market in California have revealed correlations between sales of new PV installations and hybrid ownership and neighborhood system clustering (i.e. keeping up with the Joneses). Perhaps we need to look at the broader spend on green. 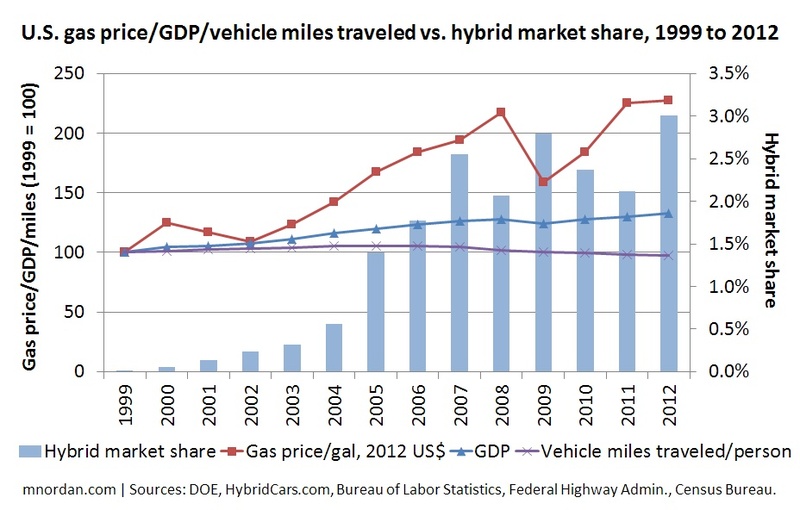 What is the share of the ‘green’ wallet that Hybrids enjoy, and how does this track over these past few years. While hybrid sales were static, residential PV sales have been rapidly expanding (http://d-bits.com/residential-pv-price-sensitivity/). one thing that can play a factor is the heavy marketing campaign from Electric Vehicles (Nissan Leaf, etc) and the award of Tesla Model S. A lot of consumers are confused by HEV, PHEV, BEV, etc. The fact EV’s are entering the main stream could be a factor for hybrid sales seen as middle of the road (going green and being cool without taking a risk). You might want to correlate EV sales with HEV sales. 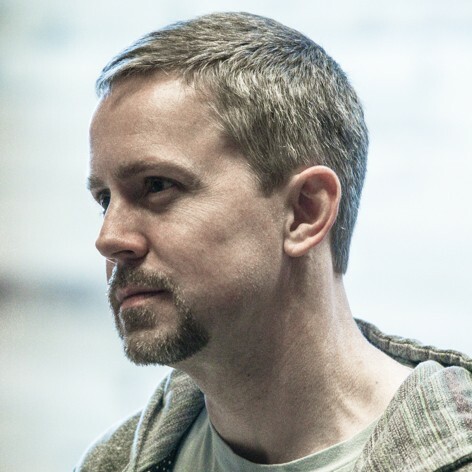 Hey Matthew – Rides I’ve received in hybrids over the past few years show me they’re getting better and better. Zippier, quieter, more stylish. A large part of the car-buying process is purely emotional. Electric motors in automotive drivetrains introduce a whole new set of attributes — more torque, silence — that purely internal-combustion cars can’t offer. I think many people are starting to recognize the attractiveness of partially-electrified driving goes far beyond the wallet. It’s not logistically possible for carmakers to respond to consumer demand by making more or fewer of a given vehicle in a given year (well, very little anyway) since manufacturing plans all the way up the supply chain are locked in far in advance. Instead, they respond to lower-than-expected demand with rebates and incentives, and to higher-than-expected by diverting customers to other vehicles (“we’re out of Priuses, but hey the Camrys are nice”). So the answer to “Why did U.S. hybrid sales take off last year?” is that carmakers made more of them. I agree with many points made here including improved design, consumer confidence, and plain “familiarity” – I’ve now driven one and it’s no longer an unknown. Mark’s point about supply-chain lock-in implies that we could have a strong idea of hybrid car sales for 2013 right now by looking at production forecasts, however this doesn’t satisfy why the automaker thought they would make more hybrids other than they saw higher prospective sales without too many incentives. My thoughts are to integrate parts of your two different data sets onto one graph – adding gasoline price from your lower graph onto your top one and it looks like there is correlation there. Proposed explanatory analysis: I suspect, without numbers data to back it up, that because gas prices remained high in 2011 AND 2012, consumers realized the business case for hybrids was stronger than previously thought, in effect higher gas prices make the numbers “work” for long/consistently enough that it seeped into the consumer calculus, Ie, if gas prices remain above $3.50 a gallon long enough a hybrid becomes continuously economically attractive. Have the wells-to-wheels spreadsheet we did on it as well. Hi Matthew. My take on the four part answer: panic, youth, acceptability, and fear. 1. The financial panic of 2008 was a panic. People stopped buying cars, and held onto their old cars longer than they normally would, leaving to pent up demand for new cars that is now coming out. 2. A new crop of young people buying cars cares about the environment, and wants to buy a car that helps to build a future they want to live in. 3. Hybrids are now being offered so widely and broadly, they are a mainstream acceptable choice from many manufacturers, not a bleeding edge technology decision with limited body styles. 4. Gasoline prices are scary, are cars that use less gas are less scary. Could it be financing options? Or have you corrected for that? I haven’t paid terribly close attention, but I recall Priusus not being leasable until recent years.